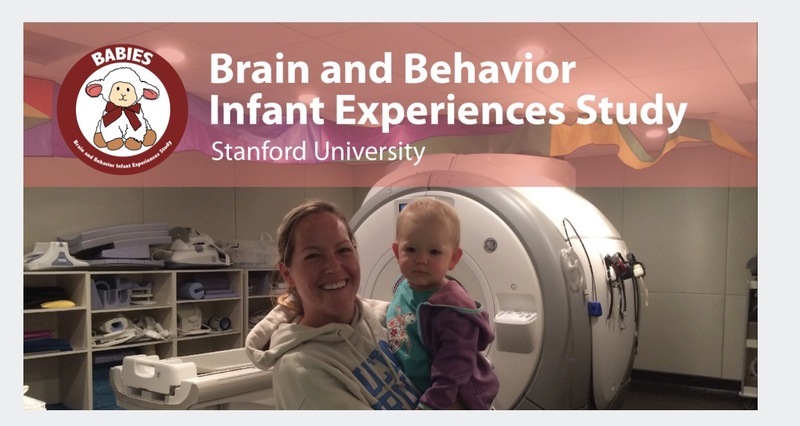 I was on Facebook when I saw an ad for the Brain and Behavior Infant Experiences Study at Stanford University. There wasn’t a lot of information on the ad, yet it looked intriguing and so I filled out the form, a simple survey about my pregnancy so far. 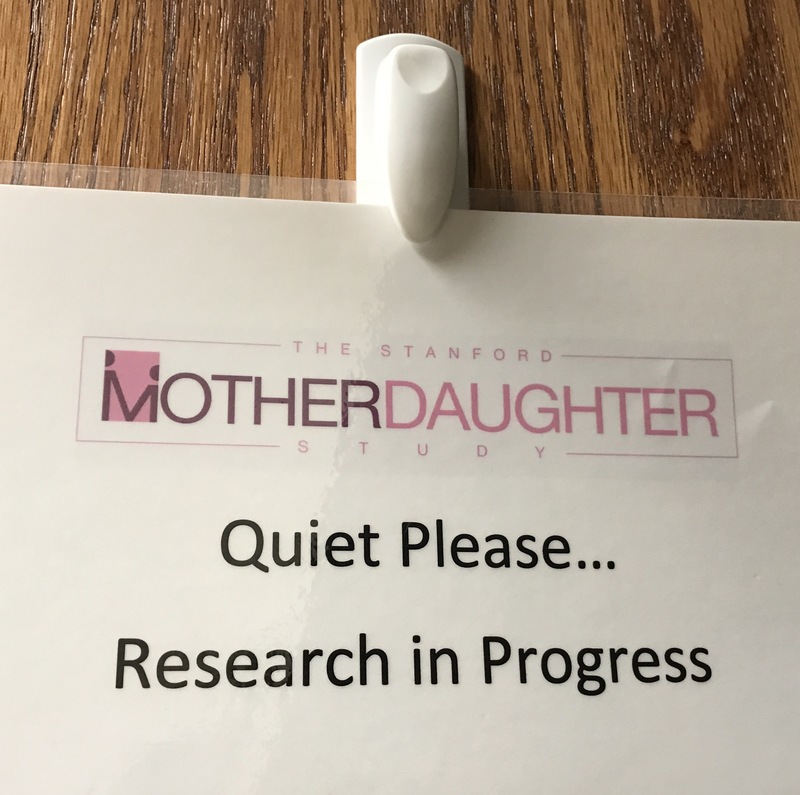 For additional information I wanted them to know I mentioned my age and how it might be interesting to have me as an older mom in the study. 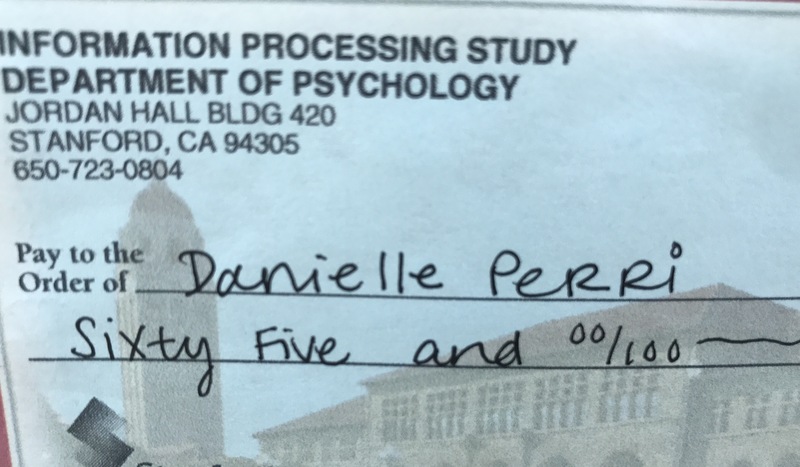 Less than a day and a half later, Marissa, a recent graduate from the Psychology Department at Stanford, called me to do a prequalification phone screen. The prescreen required lots of answers on my experiences before and during pregnancy. It took about 20 minutes to complete. At the end I was told that I did qualify and we just needed to find a time and day for me to come in. 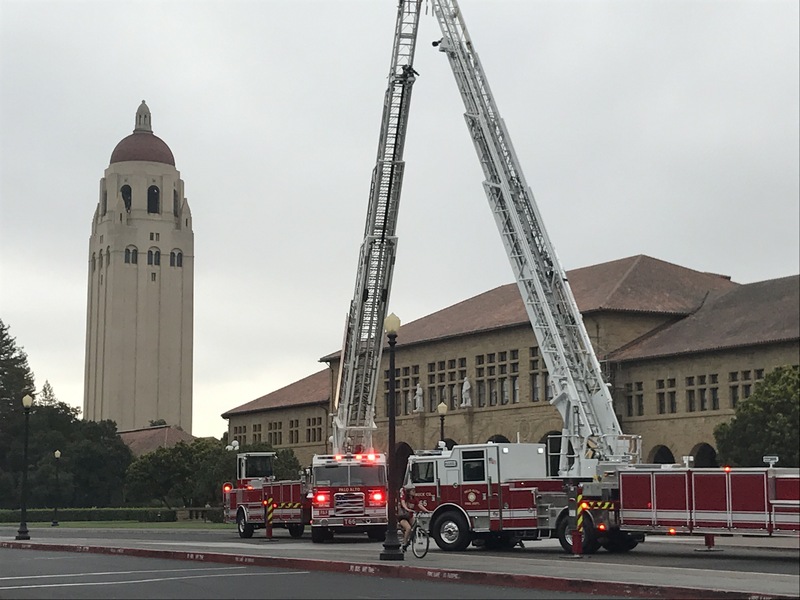 With some weekend availability, I was able to go in on Saturday at 9:00 a.m. As it was on a weekend, I got to Stanford in less than an hour. Right before the special parking I was directed to park in, there were two firetrucks having some sort of practice of drill. As promised Marissa was waiting for me in the special parking Q areas with a permit. Neither she nor I asked the firefighters about the drill and they were gone after we finished up, so I never did get to find out anything more about it than what I observed. The study had many components. There were three separate interview components, one on general life experiences, one on particular stressful situations I may have encountered (i.e. being in a or near a natural disaster, being a victim of robbery, witnessing a crime in person), and my favorite, talking about my feelings and experiences with the pregnancy so far, which was in the middle. The questions for each were similar in that I had to talk about what I had experienced, how it affected me and general emotions. For example, while in college I had had a bike stolen, one I had used to travel from one building to another. I had to rate it on a scale of 0-3 how it had effected me, how it may have changed my relationship with others, etc. Similar questions were asked about my pregnancy details in addition to some that were fun, yet hard to answer such as describing my baby’s personality in five words preferably adjectives and then explaining why I chose them. For that question based on my baby reacting (kicking, moving, turning) to stimuli including music, foods and my moods, as well as appearing to “moon” us during an early sonogram, pose for a 4D photo with hand on his or her face and shake his or her fist at us when I had to jump up and down to get him or her to turn over, I chose the words athletic, spirited, comedic, reactive and empathetic. Now obviously, I can’t tell what the baby’s personality will be like exactly, my guess is they were more interested in what my answers would be and how that would effect my feelings about my baby and pregnancy. Marissa took samples of my cheek swabs and a small hair sample to measure cortisone, a stress hormone. I was given a bathroom break in between this part and the next, and it cracked me up that this sign was used on the door. Marissa explained that B.A.B.I.E.S. shared the room with this other study, so they used their sign as well. I don’t know if my baby is a son or daughter, but this sign might fit for us, so I made sure to take a picture. After my break the study was more analytical. I had to use a computer to answer questions about how I would handle hypothetical situations and how I would describe myself. Next came a vocabulary type test where I had to pick words that were synonyms, like SAT questions, and while I knew most of the words, some I did not and had to guess. The next parts were even more difficult. I was to repeat back numbers in order starting with two digits, like 43, and going up to six digits. Then I had to repeat the same test but doing it backwards, so if I was given 43 say 34, and this also was with two up to six digit numbers. Other tests included trying to pick the mood of someone with four possible choices with just seeing their eyes, and pictures of babies having to identify them in as happy or sad based on their expression that changed from neutral to one of the two. I really do wish I was given feedback on how I had done on these parts, but that was not the goal of the study, so I will not. 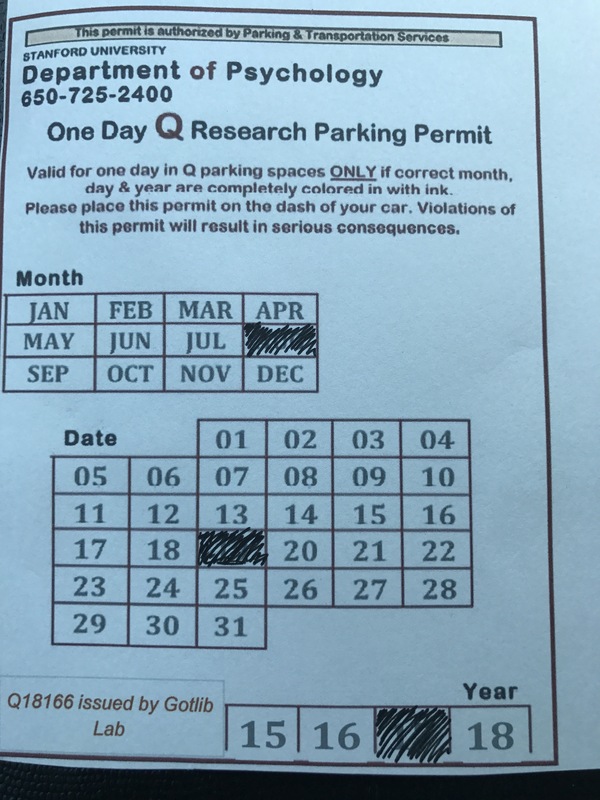 The study paid $25 an hour, and as I was there for over two hours, I was paid $65 for my time by check. The study has more components I will be able to be in if I chose to participate (which I’m planning on doing). The second part will be a set of similar surveys and tests for me and a brain scan of my baby’s brain at two weeks old, and a somewhat similar activity and home visit when baby is six months old. For those I will also get paid and get a B.A.B.I.E.S. Junior Scientist onesie for one and a special toy for baby for the other. It was great being part of this study and I look forward to baby and I participating in the other two parts.